BMX Racing is a great way to keep active! 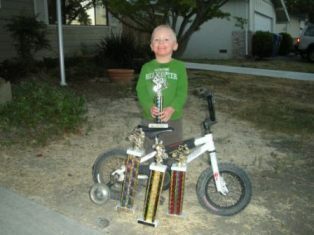 by Josh and Amie Jo D.
Jaydn, age 6, has always loved to ride his bike along with his cousins. Through a classmate of his he got involved in BMX racing. Now Jaydn, Tristan, his 13-year-old cousin, and Teagan, his 6- year-old cousin, are active BMX racers. Jaydn's younger brother, Carson, age 3, does what they call a training wheel race before the bigger kids ride. The biggest obstacle for us to overcome with BMX racing is the overheating. However we have been able to keep this in check pretty well due to the races lasting only 1-2 minutes. We use a pop-up canopy for shade and are always keeping his shirt wet. Since we start racing in mid June, the weather has been between 75 and 100. Unlike other traditional sports such as football, soccer, and baseball, the short exposure to direct sun during a race has really allowed us to maintain Jaydn's body temperature so he can participate. 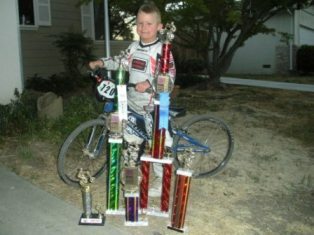 In BMX racing you start out as a novice until you win 8 races. Jaydn just recently won his 8th race. So now he is going to be in the intermediate class. By accomplishing this and meeting so many other children at all the tracks we travel to, he is really feeling good about himself. Last week he had the chance to meet and get an autograph from Team USA BMX rider, Donnie Robinson, who is from Napa. Jaydn now talks about his goal of representing the USA in the Olympics when he gets older! He still is a little reserved with the questions about his flushed red face, and the dry skin, however he simply replies, "I have a rare skin disorder and if you want to know more ask him" (and points to dad). We feel that Jaydn's story of BMX riding can inspire others to step outside the box of traditional sports with their children, and to keep encouraging their children if playing a sport does not work out. There are many ways to keep your children active and get them to interact with their peers. We personally feel that the BMX community is one of the most caring and understanding. No matter where we race, we can always find people who are like long lost friends and are willing to share and give friendship at all times. Jaydn is 6 years old and Carson is 3 years old. They both are affected with mild to moderate lamellar ichthyosis. There is no family history of ichthyosis.